For the consul of 461, see Dagalaiphus (consul 461). Areobindus in his consular robes, from his ivory consular diptych. Flavius Areobindus Dagalaiphus Areobindus, commonly simply Areobindus or Ariovindus (Greek: Ἀρεόβινδος, fl. c. 460–512) was an East Roman (Byzantine) general and politician. The scion of a distinguished line, he led troops in the Anastasian War, and served as consul in 506. During an urban riot in 512, he was proclaimed emperor by the mob, but he had gone into hiding. He died soon after. Areobindus was born into an extremely distinguished family, which combined Roman and barbarian heritage: his father was Dagalaiphus (c. 430 – after 461), consul in 461, who in turn was the son of Areobindus, consul in 434, both of Gothic origin. His mother was Godisthea (born c. 445), daughter of Ardabur, general and consul in 447, and granddaughter of Aspar, the powerful Alan general and consul in 434. Shortly after 478, Areobindus married Anicia Juliana (after 461 – 527/528), daughter of the Western Roman emperor Olybrius (r. 472– ) and his wife Placidia. Together they had a son, Flavius Anicius Olybrius Iunior (c. 480 – after 524/527), consul in 491. Another possible descendant is Dagalaiphus (perhaps by an earlier wife). In his consular diptychs, he is listed as having occupied the post of comes sacri stabuli (count of the imperial stable), and as having been accorded the title of an honorary consul. With the outbreak of the Anastasian War, he was sent to the East as magister militum per Orientem along with the praesental magistri Hypatius and Patricius. In May 503, at the head of 12,000 men, he was based at Dara to keep watch at the Persian stronghold of Nisibis and the army of Shah Kavadh I, while Patricius and Hypatius, with the bulk of the army, besieged Amida. There he repelled an attack by a Persian army coming from Singara and pushed them up to Nisibis. Eventually however he was compelled to withdraw when the Persians received reinforcements from their Hephthalite and Arab allies, and retreated to Constantia and then to Edessa. He was besieged there by Kavadh in September, but the onset of winter and the approach of Roman reinforcements forced the Persian ruler to withdraw. In the summer of 504, Areobindus launched a major raid into Arzanene, meeting little opposition and laying waste to large swathes of land before returning to Amida. With the Roman positions stabilized and the war now being carried over into Persian territory, Kavadh agreed to a truce and hostilities ceased in the winter. In 505, he was recalled to Constantinople, where he was awarded the consulship for 506, with Flavius Ennodius Messala as his colleague. In 512, he was living in Constantinople in retirement. At the time, the open advocation of miaphysite doctrines by Emperor Anastasius had caused great anger among the city's mostly Chalcedonian population. At one point, according to the chroniclers, the populace took up the cry "Areobindus for emperor" and marched to the house of his wife, Anicia Juliana, to proclaim him. Areobindus, however, unwilling to take part in a usurpation, had fled the house and gone into hiding. Nothing further is known of him, although, on account of his age, he must have died not long after. Wikimedia Commons has media related to Areobindus diptych. Five examples of his consular diptychs have survived: two complete and three half ones. The two complete ones are located in Lucca (CIL XI, 8137) and Zürich (CIL XIII, 5245); two halves with the name only are located at Paris and Besançon, and a further half with his titles is preserved at Dijon (CIL XIII, 10032, examples .3b, .3d and .3c respectively). Anicia Juliana was a Roman imperial princess, the daughter of the Western Roman Emperor Olybrius, of the Anicii, by Placidia the younger daughter of Emperor Valentinian III and Licinia Eudoxia. Flavius Anicius Petronius Probus was a politician of the Western Roman Empire. Amida was an ancient city in Mesopotamia located where modern Diyarbakır, Turkey now stands. The Roman writers Ammianus Marcellinus and Procopius consider it a city of Mesopotamia. Arbāyistān was a Sasanian province in Late Antiquity. 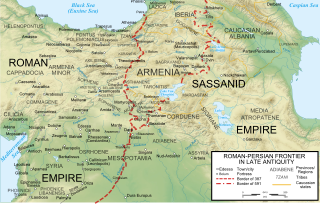 Due to its situation and its road systems, the province was a source of income from commercial traffic, as well as a constant area of contention during the Roman-Persian wars.